Wayne University was originally established in 1927 through an amalgamation of several post-secondary institutions that had existed in Detroit for several decades. These included the Detroit College of Medicine and Surgery—a privately operated school—and the Detroit Normal Training School and the City College of Detroit both operated by the city’s Public School System. The City College of Detroit originated as a junior college operating out of the Old Main building but evolved into a four year college located in the large Central High School Building. By 1934—a date sometimes used for the founding of the University—Wayne also included a College of Pharmacy, a College of Engineering and a program or school of Business Administration, all of them emerging from post-secondary programs initiated or supported by Detroit’s city’s school system. Until after World War II, Wayne professors primarily taught at the Old Main building and rented space located throughout downtown and Midtown. With tremendous enrollment of students who took advantage of the GI Bill to get an advanced education at that war, Wayne began building the attractive 200 acre campus that now occupies so much space in Detroit’s Cultural Center. In 1956, Wayne became Wayne State University with considerable support derived from the state rather than from the city. In 1959, the state’s voters approved a constitutional change that elevated Wayne State to the same legal status as the University of Michigan and Michigan State with its own elected board of regents. The building you see is the Purdy/Kresge Library. G. Flint Purdy was the father of Wayne’s library system. He earned bachelor’s degrees from Iowa State and Columbia and a doctorate from the University of Chicago. In 1936, he accepted the appointment as Wayne’s first Director of Libraries and strongly favored the development of a modern and extensive library system for the University. In 1949, the library occupied a small fraction of the space in the Old Main Building at Cass and West Warren. Sebastian S Kresge, whose accomplishments are briefly described on the webpage on this tie for the first Kales/Kresge Building that served as headquarters for the S. S. Kresge Corporation, opened several small retail stores on Woodward in downtown Detroit in the 1899. Within a short time, this developed into the nationwide Kresge chain of five and dime stores, but now known as K-Mart. S. S. Kresge strongly believed that his great wealth should be used for philanthropic purposes. The foundation he established is now headquartered in Troy, Michigan and had assets of 3.2 billion in 2013. In 1949, the Kresge Foundation granted Wayne State one million for the construction of buildings and another $200,000 for medical research. In 2013 dollars the equivalent grant would be about 12 million dollars. I presume that this explains why the library you see bears Mr., Kresge’s name. This building serves as the chief research library at Wayne for the humanities, the arts, education, business administration and the social sciences. 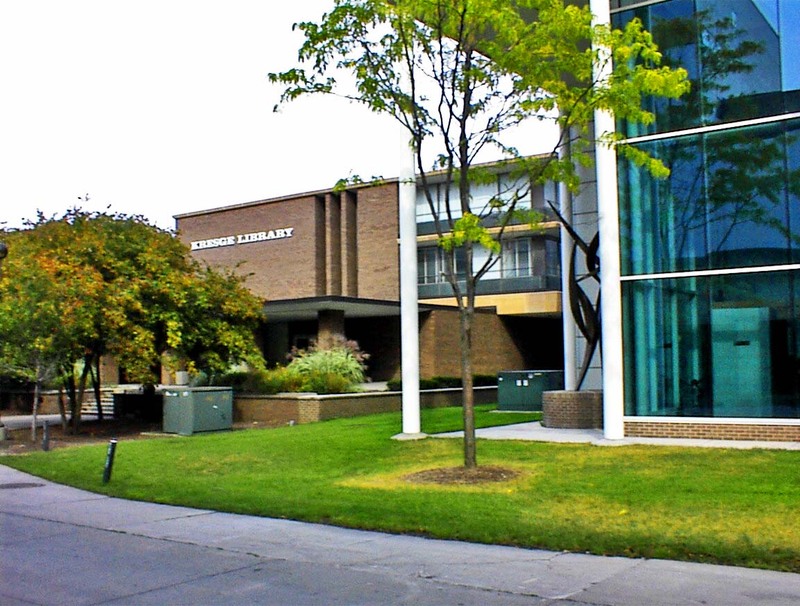 It is also home to a special college of children’s literature and is located near two other major Wayne libraries: the David Adamany Undergraduate Library and the Walter Reuter Library. It is virtually across the street from the Detroit Public Library. 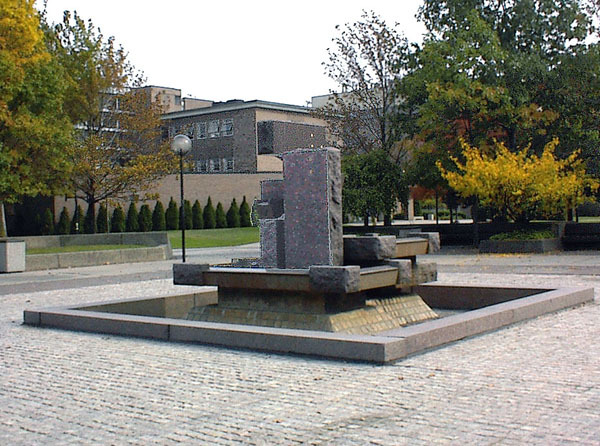 In the immediate post-World War II years, Minoru Yamasaki and Suren Pilafian, the co-designer of the Purdy/Kresge Library, gave the Wayne campus many of the architectural treasures that, arguably, make Wayne the most architecturally distinctive campus of any major urban university at present. Suren Pilafian, born in Armenia, came to New York in the 1920s to study architecture at Columbia and New York Universities and then worked with Cass Gilbert, the architect who designed the Detroit Public Library and the glorious Scott Fountain on Belle Isle. Pilafian worked in Iran and, in 1935, designed the Tehran Stock Exchange Building. Seven years later he came to Detroit where he began to work on a comprehensive plan for Wayne while employed by the Albert Kahn firm. Other buildings on the Wayne campus he designed include State Hall (1948), the College of Engineering (1949), Alumni House (1954) and the Community Arts Center and Music Building (1957).